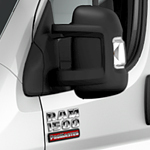 Multiple options in the Ram ProMaster allow you to customize the cargo van for your enterprise. Wheelbases range from 118 to 159 inches, total lengths go from 195 to 250 inches, and exterior heights include 88.7 and 99.4 inches. You can use a forklift to load standard-sized palettes into dual sliding door openings that measure up to 49 inches wide and a rear door width of up to 60 inches. To lower your maintenance and allow for quick maneuvering in crowded traffic, the front-wheel-drive system consists of fewer parts than an all-wheel drive, which in turn offers more space for cargo and lower the load floor. The standard 3.6-liter Pentastar® V6 gets you up to 4,440 lbs. of maximum payload and 5,100 lbs. of maximum towing. Take one for a test drive by heading for DARCARS Chrysler Dodge Jeep RAM of Rockville today.